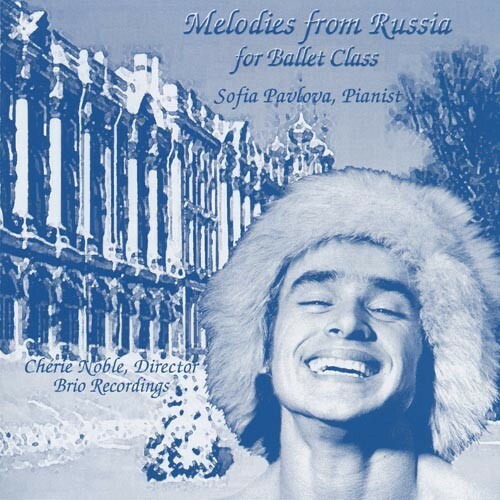 Grande pianiste , Mélodie from Russia (par S. Pavlova) (réf CD 67) des mélodies Russe et Slave jouées avec amour : valses mazurkas et tangos offrent un bon choix pour les pirouettes et les sauts. Sofia Pavlova, pianist with advanced degrees in Music History and Music Theory, studied at the Zaporozhye State Music College and Donetsk Music and Pedagogical University, Ukraine. She was the music theory department chair at the Vladimir State College of Choreography, Russia, and has written textbooks on musical accompaniment for Dance. Ms. Pavlova is an accompanist at S.U.N.Y. Purchase and Coupé Dance Theatre in Nanuet, NY. She has played master classes at Steps On Broadway and Ballet Academy East in NYC and has received high praise for her skills from numerous teachers including Fabrice Herrault, Ted Kivitt, Michelle Lucci, Alexander Proia, Rosanna Seravalli, and Ethan Stiefel. 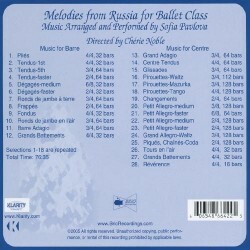 Ms. Pavlova dedicates this CD to her best friend and mentor, Olga Trusova, and to her children, Anton and Goldy. Mélodia from Russia (par S. Pavlova) (réf CD 67) melodias Russe y Slave tocada con amor : valses mazurkas y tangos ofrecen una buena elexion para las piruetas y los saltos .